The election and the discourse around it has really been bumming me out the past few days (really, how did this happen? ), but there are actually so many awesome things going on too, so let's focus on that. 1. Another Family Project- Our table and chairs cost us less than 150 dollars in all (Buy Nothing plus Antique Liquidators), but it also costs a lot of time. We have been working on this set off and on for a year (though progress was halted by a pregnant wife and Seattle rain). 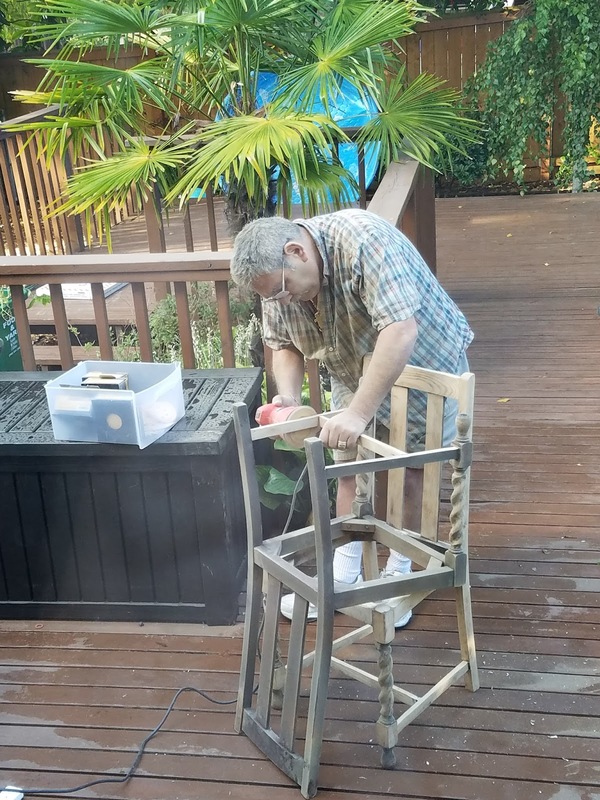 This week, the Boy's dad got in on the sanding action, and we have some real momentum going again. It sounds silly, but I am happy to have some sanding dust blowing around again, and even if the table has not been our most timely adventure, it will be that much cooler when it is done. 2. 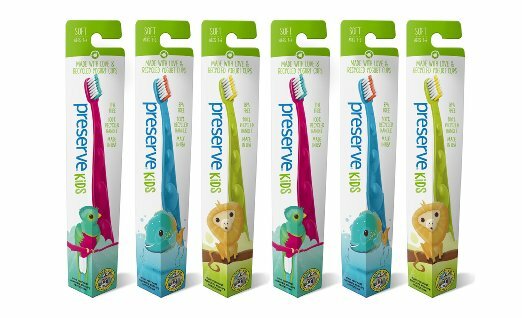 Preserve Kids' Toothbrushes- The Bub has graduated from his banana brush, and lucky for us, you can buy Preserve kids toothbrushes in bulk and save a little money. 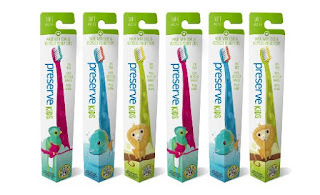 Even better, they donate money to saving wildlife for every brush you buy! Eat that Oral-B! Happy to be making a slightly better world for him. Also happy he will stop trying to steal our toothbrushes because he has his own. Because toothbrush-sharing is gross. 3.France Bans Plastic Cups and Cutlery- YES! Between this news and Morocco's ban on plastic bags, it is a good time to be a bougie environmentalist. Hopefully within our lifetime, everyone will follow suit so our oceans can start getting cleaner instead of nastier! If you want to join in on avoiding plastic disposables now, check out this post for tons of better options. 4. 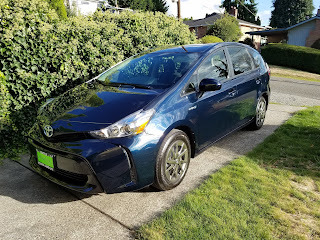 Okay, No More Buying Things- Holy crow, we bought a car. We have shared the same Dodge Neon that The Boy got for his 16th birthday for years. It will be good, because now we can fit another person in the backseat, so we aren't quite as stranded when we have company. And we got a Prius, so we will cut down on our footprint that way eventually (at least we are moving in the right direction). But having a child, refinancing a house, and buying a car in one month is enough adulting to last us the rest of the year, right? One of the bonuses of buying less is that you literally buy less, so I am done fretting over any adult money-spending for a while. 5. Seventh Generation was Bought out by Unilever- Why would I be excited this company I have loved was bought by a huge conglomerate? Won't I have to switch over a lot of our house basics? Probably, but that is Future Barbara's problem, and for now I am just pumped that eco-conscious companies have enough juice that they look like good investments. This is EXACTLY what this blog is talking about- the more you buy environmentally-responsible items, the more companies get the picture. The first place I read about this saw Seventh Generation as a niche market for hipsters, but I am not a hipster. Just a person who cares. Wrong, sucker! This is important, because it shows Seventh Generation and recycled paper goods and organic cleaning supplies in general have broad appeal. If you aren't on board yet, now is as good a time as any- just switching to recycled paper towels and tissues will save hundreds of thousands of trees.